Mantels are usually the focal points of any rooms they're found in, and there's nothing like creating an eye-catching display to really make the most of them. They're the perfect spot for everything from flowers to candlesticks to photo frames and treasured objets. 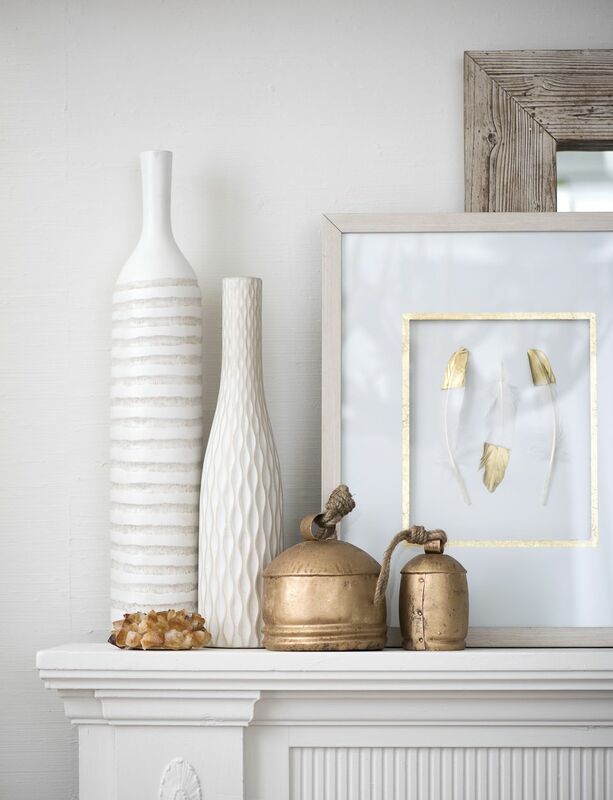 Here are some important tips to remember when decorating a mantel. DO treat the mantel as you would a piece of furniture. Consider its shape, structure, color, and style before you decide how you're going to decorate it. DON'T forget to make sure your mantel display is in keeping with the overall style of the room. Whatever you have on it needs to complement the mantel itself and the rest of the room. DON'T use a completely random assortment of items in your display. Find items that compliment each other in some way. The objects should connect to each other through color, style or theme. DO use items of different shapes and sizes. Start with taller items at the back and use smaller items as you work your way forward. DO layer items in front of each other. Layering creates depth and that's important in every kind of vignette or display. DON'T completely hide items when layering. Items in the foreground should overlap those behind - but you still need to be able to see the item in the back. DO create a formal display with symmetry. A very classic look is to place one significant item in the middle and then flank it on either side with matching items (vases or candlesticks for example). DON'T think that a balanced display has to consist of matching items. Several lightweight items on one side can be balanced with one visually heavy item on the other. DO give your display room to breathe. You don't want so many items that it looks crowded or cluttered. When too many items are forced together they get lost and no longer stand out. DO remember that in most displays odds are usually better than evens. Placing similar objects together in a group of three or five usually works better than grouping them in pairs. DON'T just put any old items on your mantel. Include things that have meaning to you in some way. DO lean items like framed art and mirrors against the wall. It creates a relaxed and casual type of display. DON'T use items that are all the same shape. Create balance by mixing shapes within a display. For instance, a stack of elegant boxes can be topped with a small sculptural item to give a little more interest to the overall look. DON'T use too many materials at one time. For instance don't mix gold, silver, pewter, glass, wood, or more at any one time. Try to limit it to two or three finishes at a given time. Ultimately, trust your own eye. It will tell you when enough is enough. DO change your mantel decor with the seasons. Mantels are focal points all year round, but the great mantle displays that can be created in the fall and around the holidays can't be beat! DON'T fret if you don't have a mantel. Beautiful second-hand mantels are available at second-hand stores like the Habitat for Humanity Restore, or you can make a DIY faux mantel.